Something has been weighing heavily on my mind since my trip to Walt Disney World in January. I have avoided discussing it because I couldn’t offer a feasible solution to the problem I encountered. When I stumbled upon one, I thought I would share some discomfort with you, the readers, and present an idea (blue sky as it may be) whose time I believe has come. The event in question started rather innocuously, as I made a mental note that I wanted to attend one of the Cultural Studies sessions of Harambe School that morning. For those of you who are unaware of Harambe School, it is a small stand with several benches in a shaded area between Kilimanjaro Safaris and the Wildlife Express in Disney’s Animal Kingdom’s Africa. Harambe School offers several presentations (such as those on the schedule below) throughout the day. These classes are comprised of relatively small gatherings which can lead to very impactful exchanges between the Cast Members and Guests. On this particular morning, a young woman was presenting a dialogue on her home country of Botswana. Aside from myself, there were only five people at this particular class. I should mention that sitting in on an early session was originally part of my strategy, as I figured I would be able to really become part of an in depth discussion since most Guests were still occupied with Kilimanjaro Safaris, Expedition Everest, Finding Nemo the Musical, and Dinosaur. Of the other five people, three sat in the front row bench constructing sandwiches as the Cast Member prepared, the other two sat near a speaker and were sipping their hot beverages. Coming prepared with food, I thought, was an excellent idea that I hadn’t thought of and began to feel pangs of hunger. This is, of course, where things went sideways. As the presentation began the group at the front carried on their conversation with one another as if the young woman was not even there. The pair by the speaker suddenly seemed disgruntled about the fact that they were having to sit so near a speaker and carried on drinking their drinks and ignoring the session in a rather annoyed manner. Both parties carried on like this for the duration of the program. I cannot begin to express just how gut-wrenching it was to try and watch this woman speak about her homeland with such a disregard for her story and presence happening all around her. It took everything I had to not speak up and tell these Guests that they needed to quiet down or move along. Mostly, I believe that I just didn’t want to add to the disruption. But it left a knot in my stomach that hasn’t left yet, it creeps in every time I think about that morning. I understand the problem, this small courtyard classroom provides a few shade-covered benches and Disney’s Animal Kingdom does not offer a vast variety of creature comforts, such as air-conditioned places to rest. This makes these benches a prime target for overheated Guests. The program, I feel, needs a new venue, because it is simply too valuable a resource to lose. Where and how it could go forward in a productive manner was a thought that plagued me. The answer as it turned out was right in front of me. A couple of weeks ago Lou Mongello and I discussed the World Showcase That Never Was on the WDW Radio Show. We spent a good deal of time discussing the Equatorial Africa pavilion that never saw the light of day. In the end, we reasoned we would presumably never see this pavilion built in Epcot because of Africa in Disney’s Animal Kingdom. A light should have gone off then, but I stumbled right on by my answer only to come back around to it this weekend while relating details of my last trip to some family members last week. EPCOT Center’s Equatorial Africa would have created two new shows, “Africa Revisited” and “The Heartbeat of Africa.” “Africa Revisited” would, “tell the story of the various kingdoms and civilizations of Equatorial Africa.” Meanwhile “The Heartbeat of Africa” would, “trace the history of Equatorial Africa… through the eyes of a traditional griot, or storyteller.” With a little editing, these two concepts could easily be brought together to tell a single cohesive narrative of Equatorial Africa and placed within the borders of Harambe. While Harambe is never hurting for traffic, it is hurting for attraction. Currently Kilimanjaro Safaris, Pangani Forest Exploration Trail, and the Wildlife Express are the only active attraction in Africa. Circling back around to Harambe School, a program such as “The Heartbeat of Africa Revisited” would require a substantive preshow. Harambe School would be able to keep a schedule similar to the one presented now by posting it in a fashion not unlike The Seas’ Duty Roster. This would not only allow a more responsive audience access to this wonderful underappreciated exhibition, but it would also allow Africa a quiet place in the shade for rest and rebooting. 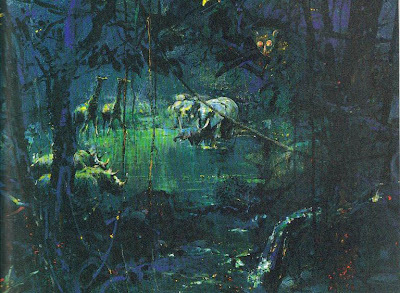 Though I am fully aware that a project like this is extremely unlikely, especially in the current economical climate, I feel that ideas like these, projects that inject not only new attractions but new interactions, are the cornerstones by which Disney’s Animal Kingdom has been most successful at spreading its message. As the park continues to grow and thrive, it will be developments such as these that will flourish and continue to make Disney’s Animal Kingdom a worthwhile destination. Where specifically is this spot? I've been a few times, but I've never seen this blackboard nor the 'classroom' spot in question. The program takes place to the right of the main entrance to Kilimanjaro Safaris, between the Fastpass Return/Pangani Forest Exploration Trail entrance and the Mombasa Marketplace. I am going to have to have a look for this during my next trip. I might not be able to stay for a class, but it will be something I would love to do in future trips! Since being a Cultural Representative myself, I understand the frustrations of teaching people about your culture and your origin - and I feel so sorry for that Cast Member too. I like your idea about having an educational attraction in Africa. It seems like the sort of thing that Disney could do with a reasonable price tag.